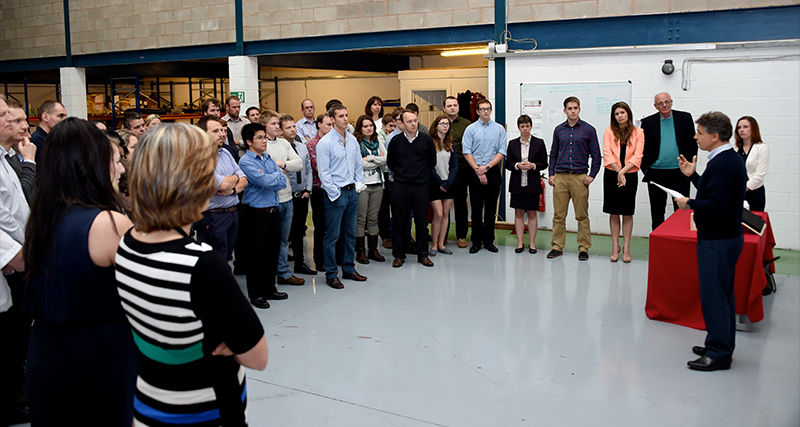 For the first time, AnTech Ltd has held a day of celebration to recognise successes throughout the company. Last week, over 50 staff and guests gathered to celebrate over 115 years of long service, international patents and internal departmental achievements at the company’s head office in Exeter. AnTech’s in-house team organised and designed awards to commemorate individuals that have in particular helped bring the company to its success. A marquee was constructed and decorated with marketing materials ranging back over the 23 years the company has been in business. The event celebrated 11 loyal and dedicated employees who have all reached milestones within the company, beginning at 5 years’ service and with the longest serving member of the team clocking up an impressive 17 years’ service. The individuals were awarded personalised postcards with caricatures of some of the AnTech team and a bespoke service pin, acknowledging the milestone. Certificates were also awarded to the engineers whose work on the Acrobat Gyro has been internationally patented. The awards covered every area of the business from engineering design and development to manufacturing and sales. Furthermore to reward the whole company, special guest and MasterChef finalist Pete Hewitt was in attendance. He helped mark the occasion by cooking an exquisite two course Japanese menu, which featured pork belly and shoulder ramen, and pineapple fondant, ending the event on a high. AnTech also has been shortlisted as a national finalist in the Technology Innovation of the Year Award category at this years’ UK Private Business Awards, which celebrates the best of UK private businesses and their contribution to the UK economy. The company is enormously proud of its committed workforce and look forward to many more team members achieving long-service status. For more pictures and a round-up of social media from the day, please visit AnTech’s social media channels.